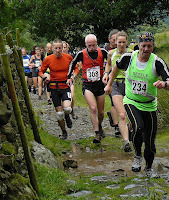 Borrowdale Fell Race.17m/6.500ft. Sat 1st Aug. This race used to be very popular with Horwich runners many moons ago, but only a few intrepid folk make the trip now outside of it being a championship race, which is a pity as being one of the shorter ’Longs’ it is a great race to practise racing on the big fells without being out too long. Unless of course the weather is down or you bonk! Ian Charters was out first counter – being just a stroll in the park for him – Ian ran 4.29.21 for 171st place. Rachel Metcalfe is really putting in the races at the moment, surprised to see her doing Borrowdale without her running partner Suzanne. Rachel was 253rd in 5.04.40. Our only other finisher was Tony Varley, still taking on these big challenges and running 5.42.35 for 297th. I believe he found the race this year a bit tough. 301 finished the course. Wagon & Horses 10 – Lancaster Sun 2nd Aug.